If you have been a reader of my blog for any amount of time, then you know that our family LOVES to snack. As a mom of little ones, I am constantly trying to find snacks for them that aren't pure sugar. You ladies that are moms can relate, I'm sure. :) My third child is a grazer, meaning he eats very little at meal times and snacks lightly throughout the day. No matter how I try to change that...it just is what it is. So our favorite, easy snacks are probably cheeses, fruits and crackers. Peanut butter is also a frequent flyer on the snack list too. :) I am a fan of anything crunchy, sweet and/or salty...snacks don't hang around our house for very long at all. Wow! What a story. 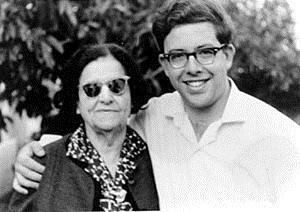 I love supporting small companies whose roots go deep and the love of family runs strong. 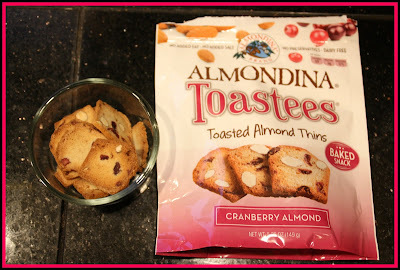 I was pleased and honored when offered the chance to review their amazing almond thins. So, for this review I was sent several bags of Toastees. The flavors I received were Cranberry Almond, Coconut Orange and Sesame Almond. The other available flavor is Lemon Poppy Almond, which sounds amazing! I love lemon anything so I would love to try that flavor sometime. 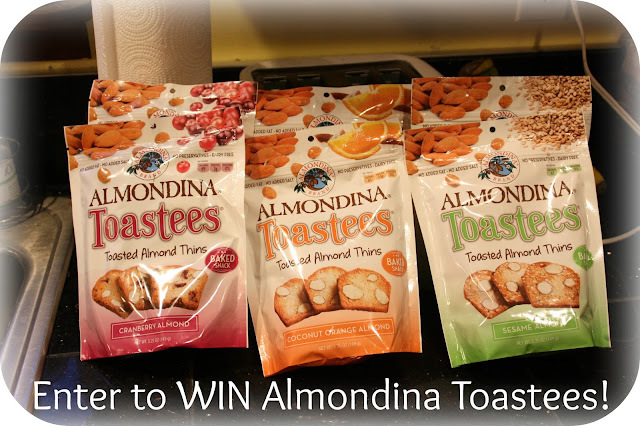 When my Almondina Toastees arrived in the mail, my children got wind of the fact that there were snacks in the box and of course, we had to open it immediately. The first flavor we tried were the Cranberry Almond and these proved to be the favorite out of the entire box. 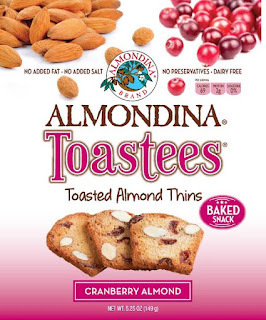 These little almond thins are small, yet they pack an enormous crunch and just the right amount of sweetness. They are not overly sweet, just enough to satisfy a sweet tooth craving. I get those a lot these days and a handful of Toastees does the trick! The Coconut Orange flavor is also very tasty…a slight orange flavor with just a hint of coconut which makes for a nice blend of savory bites, perfect for that afternoon coffee break. I won’t tell you how long one bag of Toastees lasted here…they went FAST though! I had to hide the rest of my bags just so I would have a snack for my special “mommy break” that I enjoy in the evenings. I so enjoyed reviewing these snacks, and was grateful for the opportunity to share them with you today. 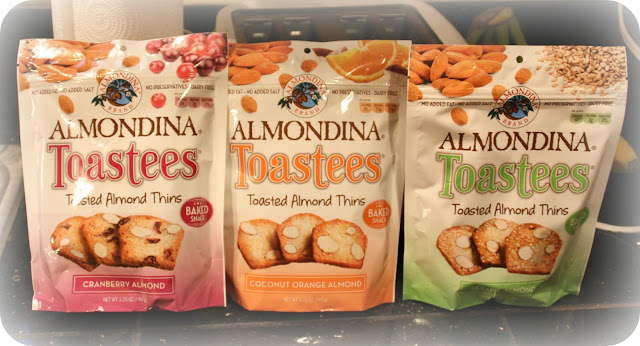 If you would like to find some yummy Toastees by Almondina, you can find them at the following stores and websites…Sprouts Markets, Bed Bath & Beyond, Publix, Fairway Markets, Kroger Michigan, Amazon, Almondina.com and others. Each bag retails for around $3.99. I would like to try The Mixed Sampler Gift Basket. I want to try the sesame almond. I would like to try the Choconut® cookies. I'd love to try the original Choconut Almondina's. Thanks so much. I would like to try the Coconut Orange flavor. I'd like to try their Dark Chocolate Dipped Cookies. I want to try their Gingerspice cookies. I would really love to try the sesame cookies, they sound really good. Thank you. I want to try the Gingerspice flavor, sounds yummy. I would do the Original! I'd like to try Milk Chocolate Almondina Delights. I pinned at https://www.pinterest.com/pin/52635889376477165/. Copy and paste didn't work for me on the Rafflecopter. Sorry! I would like to try the cranberry almond toastees. The Choconut cookies sound good. Thanks so much! I would like to try the almondina coconut. I'd love to try their Cranberry Almond toastees! The dark chocolate dipped cookies look good. 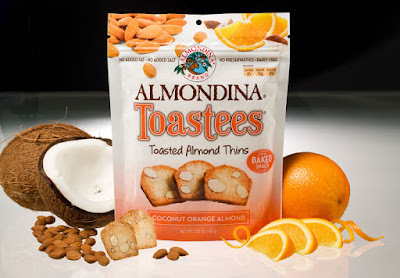 I think the Coconut Orange Almond Toastees sound really good! i want to try the dark chocolate dipped. they look really good. I would love to try the Sesame cookie. I would like to try the dark chocolate dipped cookies. The dark chocolate chip cookies dipped look so good! Thanks so much for the chances to win. I would like to try the Choconutcookie. I would love to try the Dark Chocolate Dipped Almondina. I would like to try their "Choconut" cookies. The Almondina Choconut Cookie would be my item of choice. I want to try the Choconut Cookies. I would love to try the sesame cookies! They sound exotic! I would love to try the coconut orange almond toastees. Thanks for the chance. I would love to try the Dark Chocolate Dipped Cookies. I'd love to try the dark chocolate dipped! I would like to try their Gingerspice cookies. I would love to try the Toastees Gift Basket because it has a little of all of the items they have available to try in one package.